Purchasing a drilling rig is a big investment, and you want to be sure that you buy the right rig for your needs. How do you decide what rig to buy for your business? Here are some things to consider as you evaluate your different options. National Driller offers some helpful tips for anyone thinking about investing in a new drilling rig. Some of the key factors in choosing the right rig include reliability, ease of use and safety. The importance of each of these factors is self-evident. Reliable drilling rigs save time and money, and prevent delays due to equipment failures. Rigs that are easy to use can be more profitable over time, may reduce operator fatigue, and could result in fewer breakdowns due to operator errors. Last, safety is always an important consideration for a number of reasons. Aside from considering these factors, it is also helpful to use an “85 percent rule” to identify rigs that will best suit your needs. National Driller says that asking yourself these three questions can help you narrow down your options. What type of drilling do you expect to do at least 85 percent of the time? Selecting the drilling rig that is best suited to the majority of your work may be more efficient than choosing a larger rig that is way more than you need for most of your drilling projects. What type of geology will you be drilling in more than 85 percent of the time? Mud rotary and air rotary drills each have their strengths, but for different types of terrain. By selecting a drill option that is best suited to the geological conditions that you expect to encounter most often, your drill will provide the greatest usefulness over time. Where do I perform at least 85 percent of my work? Location plays a large role in the efficiency of any drilling rig. While larger rigs can handle larger projects, they may also be difficult to transport to and from some sites. If you’re constantly going from job site to job site, having a rig that’s more compact or easier to transport might make more sense for you. 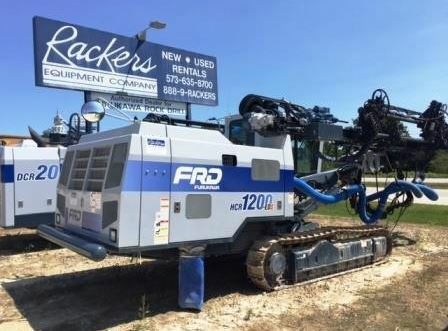 Rackers Equipment Company has a large selection of new and used hydraulic drills, air track drills and compressors from some of the leading manufacturers. You can always expect excellent service and fair prices when you buy equipment from us. To learn more about any of our equipment, give us a call today at 573-635-8700.